Very Good. Return Revised Edition (Redemption (Karen Kingsbury)) by Karen Kingsbury, 2009-09-01. Trade paperback (US). Glued binding. 368 p. Redemption (Karen Kingsbury), 3. Very Good. Return (Redemption (Karen Kingsbury)) by Smalley, Gary. Trade paperback (US). Glued binding. 384 p. Redemption (Karen Kingsbury), 3. Good. 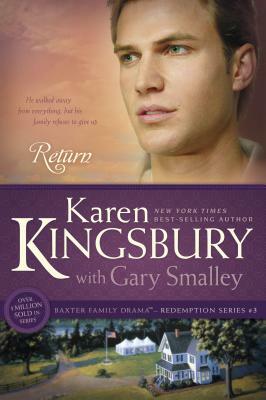 Return (Redemption (Karen Kingsbury)) by Smalley, Gary, 2003-09-30. Trade paperback (US). Glued binding. 384 p. Redemption (Karen Kingsbury), 3. I have a new favorite author, Karen Kingsbury has won my heart with this series of books! This book was another great read. The prodical son, Luke, goes thro some pretty terrible situations , and his family suffers also. But prayer and the love of his family for him shines throughout the book. A must read for everyone. Oh how close to home this series comes to me as well as many others I am sure. I like to think that this was one of the best books in the series. It leaves you excited and axious to get to the next one. It is a story of faithfullness and surrender. I found myself so mad sometimes, and then with a turn of the page, smiling with awe of what an awesome God we have and the miracles he can work in lives. Ours, as well as Luke's and the Baxter family.